City employees (L to R) Laura Haynssen, Barb Morin, Nora Riemenschneider and AFSCME member K.C. Blees pause for a photo on the scaffolding at the Habitat construction site in Frogtown. City of St. Paul employees serve the public every day at work. But this summer, some are using their vacation time to give back to the community as well. In a coordinated effort among the city’s agencies and departments, city staffers are adopting six daylong volunteer shifts on a Habitat for Humanity construction site in Frogtown. They’re helping build a single-family home on a previously vacant lot at 632 Edmund Ave.
Ricardo Cervantes, director of the Department of Safety and Inspections, coordinates the city’s participation in the Habitat build. He said the volunteer effort is a growing event for the city, which increased its commitment from five days last year to six this year. Erica Brown (L), Jim Giebel and Dolly Lee haul lumber on the site. AFSCME member Kate Aamot (R) and Bridget Morales apply caulk along the exterior wall. IBEW Local 110 member Dan Moynihan, a senior electrical inspector with the city, works along the roof. Habitat for Humanity site supervisor McKinsie Clyde (R) and AFSCME member Todd Freking watch as Nance Lee Mosquera works with a saw. Construction at the Frogtown site began in June, and volunteers – roughly 15 to 18 per day – will be on hand five days per week for roughly 10 to 12 weeks, site supervisor McKinsie Clyde said. The City of St. Paul teamed with Travelers Insurance and Securian Financial to fill most shifts at the site this summer. Along with North Minneapolis, Frogtown is an “area of emphasis” for Habitat in the Twin Cities. Clyde can point to other homes in the neighborhood Habitat has built or refurbished. Working as an electrical inspector, IBEW Local 110 member Dan Moynihan has been inside plenty of low-income properties across the city. Habitat vets potential owners, requiring applicants to complete a class in home ownership and put in 300 to 500 hours of “sweat equity” on the construction site. The three-bedroom, 1,500-square-foot house on Edmund Avenue will be sold to a family of five, with two adult immigrants from Ethiopia. The tentative closing date is in December. How are members of your union giving back? 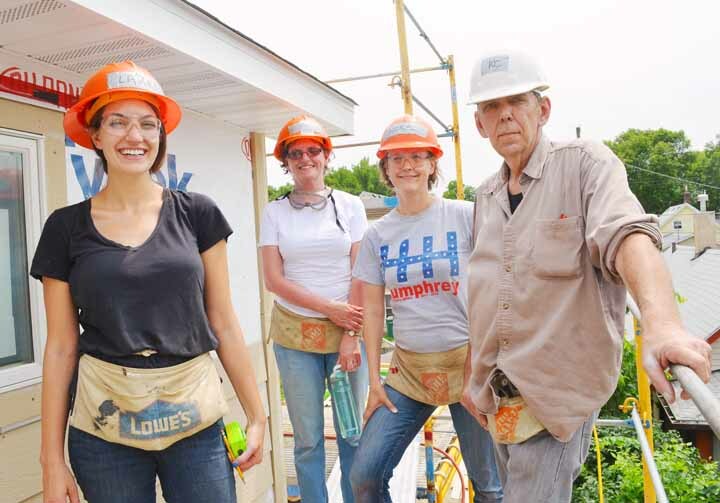 We know union members across the Twin Cities are giving back to their communities. Help us give them the recognition they deserve! Send story tips to mmoore@stpaulunions.org.